The thriller of the year! Come sink your blade into this slasher book with ALL the twists you really won't see coming. Final Girls - named by the horror industry as the only girl left alive after a massacre. In Quincy's world, there are three of them - the first being Lisa, the second being Sam and then Quincy. Quincy survived a night with her friends at Pine Cottage that was supposed to be a fun weekend. Stabbed and somehow left alive, Quincy's tried hard to make her life as normal as possible. With a successful blog on baking and an understanding boyfriend, she's moving forward as much as she can. For ten years she's managed with the blessing (?) that she remembers almost nothing about that night. But she does hold secrets on how she handles some of her post traumatic stress and she keeps that secret close to her chest. Then one day, she gets a call that Lisa has been found dead in her bathtub and shortly after, Sam shows up on her doorstep. Bound by their survival stories, Lisa brings Sam into her home. Sam tests her and pushes her to remember and deal with her residual feelings of anger. But can Sam be trusted? Can she trust her own memories? This book has been EVERYWHERE and it holds up to its hype. Written almost like a slasher film, it's taut, tense, action packed and keeps you on your toes. Trust me when I say that what you think it is, probably isn't... and it isn't THAT either. Flashing back to the night in question, we get a deep look into Quincy ten years ago and to her today - building up into a final reveal you really won't see coming. Riley Sager has a way of seamlessly building Quincy's world and everyone in it. I read this in one sitting and couldn't put it down. After turning the last page, I immediately went into conversations with others who have read it and we all readily agree - it's a shocker... and a good one! Already being touted as the thriller of the year, this book will be talked about for quite some time - get yourself a copy and join the conversation! Here is probably one of the most talked about thrillers of 2017 - and with good reason! When the King has a blurb on the cover, I'm drawn to it instantly. When he says this is the best thriller of 2017, then I need it! 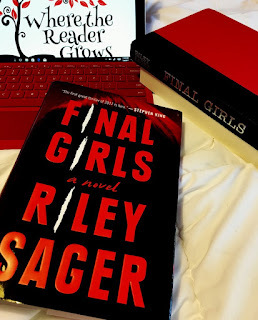 Riley Sager's debut FINAL GIRLS was an incredible thriller with a nonstop pace that had me flipping through pages. Quincy, Lisa, and Sam are all Final Girls. All three are the survivors of horrific, horror movie worthy killings. Quincy was the only one to make it back from her vacation with five college friends. Lisa survived a knife attack when her nine sorority sisters did now. Sam went up against the Sack Man during her shift at work at the Nightlight Inn. Despite the constant attempts from the media, the three girls have not met. They just want to get on with their lives. Quincy has finally gotten on with her life - a fiance, job, beautiful apartment, and her Xanax make for a great life. That is until Lisa, the first Final Girl, is found dead in her bathtub, from an apparent suicide. Sam, the second Final Girl, shows up on Quincy's doorstep and her world is turned upside down. Quincy is our narrator, but we alternated between past and present to try and work through all the lies and buried memories. The characters were so well developed - you could relate to Quincy and she felt like a real person. The girls are multi-dimensional and as the story goes on we learn more and more about them. I loved how original this story was - a girl wandering out of the woods and covered in blood. That only happens in horror movies, right? Not for these Final Girls, that is only the beginning of their nightmares. From the first page this book has you on the edge of your seat. If I didn't have work interrupting, then I would have easily read this in one sitting. The ending! Did not see that coming - I thought I could predict where things were going to end, but then a huge twist was thrown in. 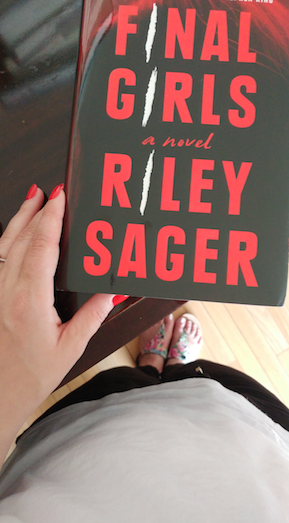 Sager tied together everything so well in this novel and I will be waiting for more from this author! If you want an addictive thriller with nonstop suspense, then stop looking because this is the book you need!! Quincy Carpenter is the sole survivor of a massacre that killed six of her friends while they were on vacation at Pine Cottage ten years earlier. The media dubbed her one of the Final Girls; joining Lisa and Samantha, who were also survivors of murderous rampages. These girls screamed louder, ran faster and fought harder. They survived. Quincy is trying to move on with her life, and is doing well until Lisa is found with her wrists slit in her bathtub; an apparent suicide. Leaving Quincy reeling, Samantha shows up on her doorstep, making Quincy relive bits of her past that she has fought so hard to forget. As the details surrounding Lisa’s death become clearer, Quincy begins to unravel the truth, Sam’s truths and her own, to remember that night at Pine Cottage…the night she became a Final Girl. 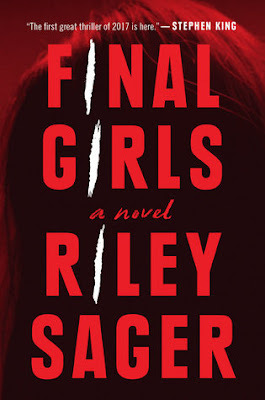 Final Girls is the debut novel by Riley Sager. It is an intense, on the edge of your seat, completely addictive mystery thriller. I refuse to believe that this novel was a debut. It was that amazing. From the first page, I knew this would be a book that I would need to read in one sitting. I finished this one in an afternoon easily. The concept for this novel is completely original; Quincy is a Final Girl, like the girls at the end of the horror movie who stumble out of the woods and flag down an unassuming vehicle. Except, that this was not a movie. This was her life. She stumbled out of the woods, covered in blood, and escaped becoming HIS (she will not speak his name) final victim that night at Pine Cottage. As she works through her past demons, she is surprised when Samantha, another Final Girl (having survived a massacre at a motel) arrives at her home. Sam quickly throws Quincy’s life upside down as she brings up past memories and calls into question everything that Quincy knows. From the initial moments, this novel proves to be a suspenseful, engaging read. The plot was intricate and smart. 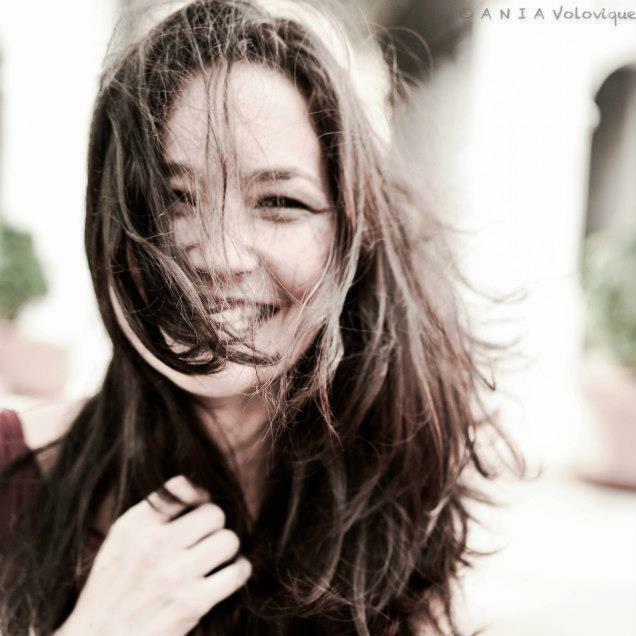 The novel is narrated by Quincy, both in the present and in flashbacks to the past, before and after the massacre, as she tries to piece together her lost memories. This one has many twists and turns; I was left reeling. Just as I was beginning to understand what was happening or guess where Sager was leading me, it turned out to be a red herring and I was left baffled. By the ending of the novel, when all the pieces come together and the revelations are made, I was in complete shock. I also loved the character development in this one. Quincy Carpenter is both tough and vulnerable. I loved watching her experience her survival’s guilt, struggle to deal with her loss and see the media circus that follows her. I also loved watching her piece together what happened that night. Frankly, I believe that Final Girls by Riley Sager is a book that everyone will be talking about in 2017. I would also be shocked if this one didn't get picked up for its film rights. If you are a fan of the mystery/thriller genre, or just a fan of an extremely well-developed narrative, you’ll want to add this one to your TBR pile and pre-order lists. This one releases (and starts taking the literary world by storm) July 2017.